The financial sector has a key role to play in contributing to the green transition. 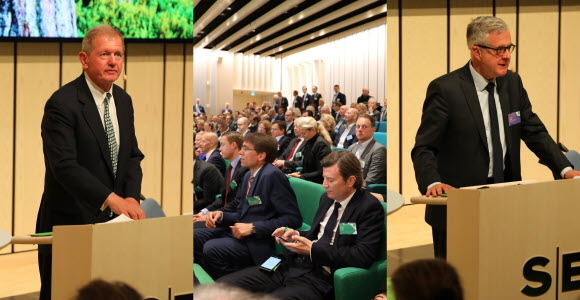 That was the message from SEB’s Chairman, Marcus Wallenberg, when he welcomed the attendees at the Swedish–French conference on the green economy that was held at Arenastaden on Tuesday. His message was reiterated by ministers and government officials from both countries and some 25 speakers from companies, institutions, authorities and colleges. The conference was part of an agreement on a Swedish–French strategic partnership on innovation and green solutions that was signed by Sweden’s Prime Minister Stefan Löfvén and French President Emmanuel Macron last year. Both countries have taken strong initiatives in the transition to a green economy, supported by ambitious climate targets, innovative laws and environmental taxes. In the financial sector, as well, both countries have made great progress, not least regarding the development of green bonds, where SEB and the French bank Crédit Agricole are among the leaders in the world. It was therefore also fitting that the task of sponsoring the French–Swedish conference fell on SEB and Crédit Agricole, which together with the French embassy hosted the conference. Among the high-profile speakers from the political arena were Per Bolund, Sweden’s Minister for Financial Markets and Consumer Affairs, and Odile Renaud-Basso, Director-General of the French Treasury, who greeted the conference via videotaped message. Other speakers were Xavier Musca, Deputy CEO of Crédit Agricole, Jean Bossinot, Head of Financial Stability for the French Ministry of Finance, Mats Andersson, former CEO of AP4, who has studied green bonds on behalf of the Swedish government, Maria Wiimne, deputy CEO of Kommuninvest, Eila Kreivi, Head of Capital Markets at the European Investment Bank, and a host of others who participated in panel discussions. The tone was hopeful and opportunity-oriented, despite the major challenges. The transition must be conducted literally to save the world. Or as Jean Bossinot expressed it: “There is no planet B”.